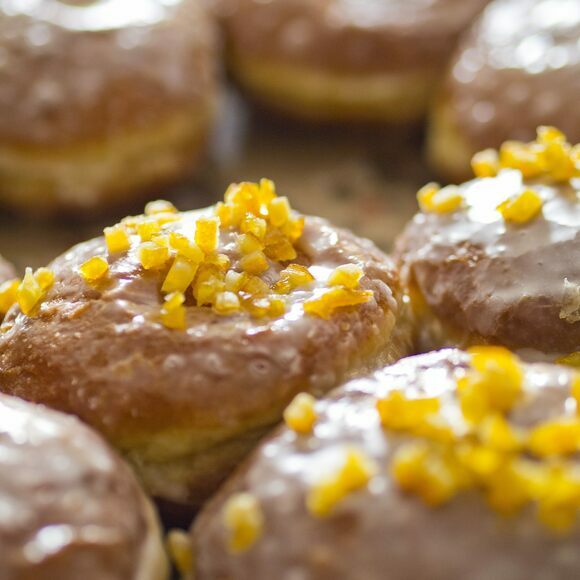 These Polish pre-Lent doughnuts have taken on a life (and an eating contest) of their own in the United States. Golden-brown with a characteristic light ring around the middle, these yeast-risen doughnuts are deep fried and covered with powdered sugar or fried orange zest. They were first made by Polish people using up the last of the sugar, lard, and fruit in the house before the austerity of Lent. In Poland, they’re filled with rose petal, prune jam, and even fried rose buds, and are eaten on Fat Thursday (the Thursday before Lent) as part of the zapusty, or “carnival season.” These pre-Lent festivities continue to the present day, and bakeries making pączki are known to be the site of hours-long lines on Fat Thursday. Pączki immigrated to the United States alongside their Polish creators and became ubiquitous in Polish communities on the Eastern seaboard and in the Midwest. In the United States, they’re eaten on Fat Tuesday (Mardi Gras), the day before Lent begins. While some pączki are filled with the traditional rose and prune, they’ve also become a vehicle for more inventive fillings, ranging from banana cream to charred rosemary. Pączki are also eaten in the United States on Casimir Pulaski Day, which is particularly observed in the Midwest. Born in Poland, Casimir Pulaski was an American Revolutionary War hero who has been dubbed “the father of the American cavalry.” Raise a toast—or a doughnut—to Polish American culture by enjoying one of these clouds of dough on the next Casimir Pulaski Day. This Polish Easter tradition artfully assembles symbolic foods, from bread to lamb-shaped butter. Russian Mardi Gras features blinis, fistfights, and burning effigies.